Call Now 216-769-4008 for Free Estimates! We have had the pleasure of providing full service auto repairs to many satisfied customers in the Greater Cleveland Metro area for the last seventeen years, and look forward to being your solution for your auto collision needs. We are a group of a highly skilled, educated, and experienced auto repair technicians that can provide you with…. Here at Deluxe Auto Body & Frame we take our work seriously and we take the stress out of your collision. Our highly skilled technicians are kept up to date with the latest technology through ongoing education. We know how perplexing and frightening a collision can be and we are here to help 24/7. Just give us a call at 216-769-4008 and we will respond immediately by providing you with the towing service that you require. To make things a little easier we can offer you a $250 discount on our repair services if you have a high insurance deductible ($500 or more). As someone that has become involved in a vehicle collision in the Greater Cleveland Metro area you need the right help for your vehicle and fast. Here are the main reasons why you will want to use us as your vehicle collision repair specialists…. We care about the situation you are in. Accidents happen 24/7 and we are ready, willing and able to provide you with immediate and hassle free roadside assistance if this happens including taking you to a reputable car rental service if required. We are price comparative and affordable. We take the hassles out of dealing with your Insurance Company requirements. Our Estimates are FREE and can be done on line if you prefer. We keep you fully informed of what it is going to require to get your vehicle back into pre collision condition. 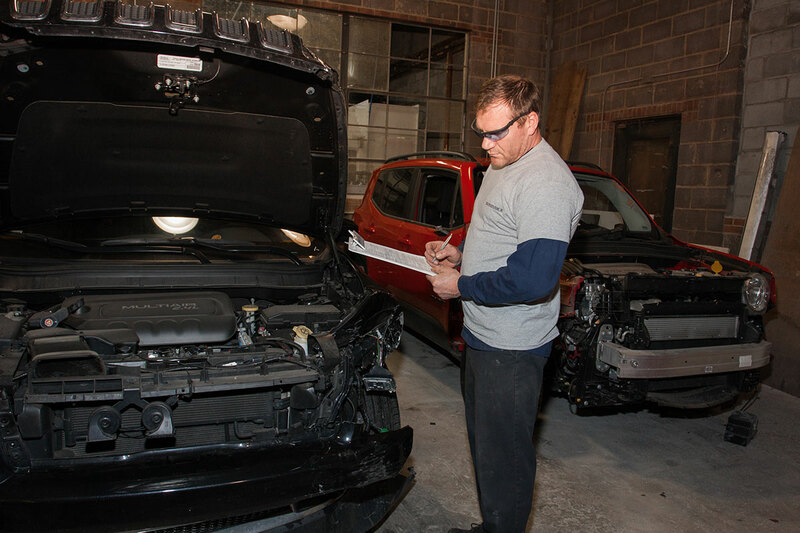 We have a highly trained, skilled and experienced group of auto collision specialists on staff who are up to date with the latest education and technology. We know how important your vehicle is and we work relentlessly at getting it repaired and returned to you as quickly as possible but with no sacrifices made in regards to quality and workmanship. We rely on trusted dealers for replacement and repair parts. We utilize leading technology and equipment to perform our services. We help to take the sting out of high insurance deductibles with a $250. Discount. We have a very high reputation to protect and continue to build throughout the Greater Cleveland Metro area as the best in the business when it comes to Collision Auto Repairs and we are not going to disappoint you when you trust us to make getting through your collision a much easier experience. Please call 216-769-4008 or fill out the online form and upload few photos, we will contact you with the quote. 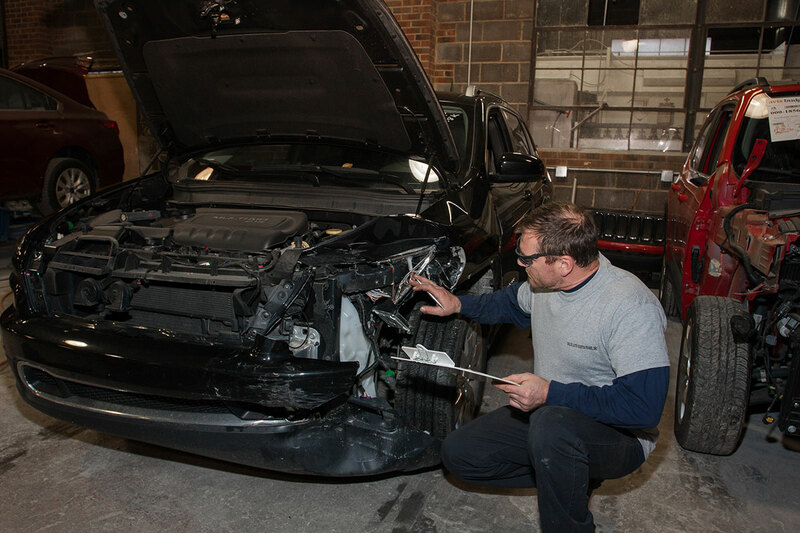 Our impeccable Auto Body Repair Services begin from the first moment you contact us beginning with high quality and caring customer service from start to finish. From the moment of your collision we are ready to respond with our 24/7 towing service. Once your vehicle has been placed in the hands of our highly skilled certified technicians we will begin the collision repair process. This will include a careful inspection of the damage including any frame damage to provide you with a speedy and accurate quote. The repair process will be carried out with the use of quality replacement parts and precision work. This is followed up with ensuring that the appearance of the vehicle is to your complete satisfaction. We have expert color matching professionals on site and the very best there is in vehicle painting technicians. What you can expect from our up to date and modern collision technicians is to have your vehicle returned to you looking like new and complete with a thorough cleaning. You can also expect to receive a nationwide warranty as we stand behind our impeccable work. For your added convenience we will pick up your vehicle for the needed auto repairs and return it to your door when finished. It is most unfortunate when you are involved in a collision and of the course the priority is your safety. Once potential injuries have been dealt with the next real concern becomes the accident damage that has been done to your vehicle. This can be stressful and can cause anxiety as to what you do next. All it takes is a phone call to us here at 216-769-4008. We will immediately provide you with the accident roadside assistance that is now necessary to tend to your vehicle. We will take control of your unfortunate circumstance by making sure you have transportation to one of our associate car rental companies. Then we will carefully tow your damaged vehicle to our collision repair facility. A detailed inspection will be conducted by our highly skilled and trained auto collision specialists who will provide you with a FREE estimate. With your approval we will submit your claim to your insurance company and handle the claim process for you. 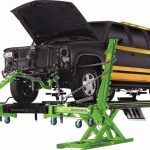 The next step will be carrying out the necessary repairs using the very best of replacement parts and workmanship all carried out in a timely manner and keeping your fully informed of its progress. Your car will be returned to you fully cleaned and just like new. You can count on our Performance Guarantee to back up our customer satisfaction. DID YOU KNOW… By law you have the right to choose any auto collision repair facility and you are not restricted to those recommended by your Insurance Company! It’s not always major auto collisions that create a need for auto repair. Simple mishaps like weather damage, or dents and dings from objects striking your vehicle may need attending to. If this type of minor damage is not corrected quickly then it can lead to more serious damage to your vehicle. Here at Deluxe Auto Body and Frame we use a very affordable and cost effective process called Paintless Dent Repair. Be sure to ask us more about this and let us get your vehicle back to looking its best. Our highly skilled and experienced auto repair collision specialists are armed with the very best of technology to provide you with the most accurate and detailed estimate. The data collected by our collision repair experts is entered into a computer system that will record and analyze this data to provide detailed reports. The initial inspection may not allow for detection of total damage as some vehicle components that have been damaged may not be observed until the disassembly of the vehicle. Your estimate is then submitted to your insurance provider for approval. Negotiations may take place regarding the recommended collision repairs and price quotes. Your Insurance Company makes the final decision as to whether the vehicle qualifies for repairing. After final approval has been received from your Insurance Company our vehicle collision experts will begin the next step. Your damaged vehicle will be carefully disassembled. 1. A detailed inspection will be carried out through each segment of this process to determine if any unseen damage has occurred. 2. Internal structure repairs are identified. 3. If necessary your Insurance Company will be notified of additional finding and further negotiations for repair will be carried out. 4. This additional inspection may create a need for additional parts ordering. A detailed list of parts required will be compiled. These parts will then be sourced and ordered. 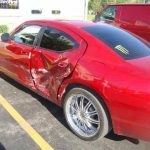 Actual repair of the damaged vehicle will not begin to all parts have been received by us here at Deluxe Auto Body and Frame. This is a requirement so we are able to complete the collision repairs from start to end in a timely and efficient manner. We insist on only using those parts that are supplied to us by trusted and reputable dealers so no comprises are made to the restoration of your vehicle. The priority in this step is to ensure that the unitized body of the damaged vehicle is restored back to the factory specifications. Using highly sophisticated measuring equipment and technology our auto collision technicians will monitor each segment of this process. The data collected through this technology allows us to provide a complete analysis of the frame of the vehicle which provides us with the knowledge needed to repair it with precision. Once the framework has been examined and restored attention is now put on the body repair requirements. 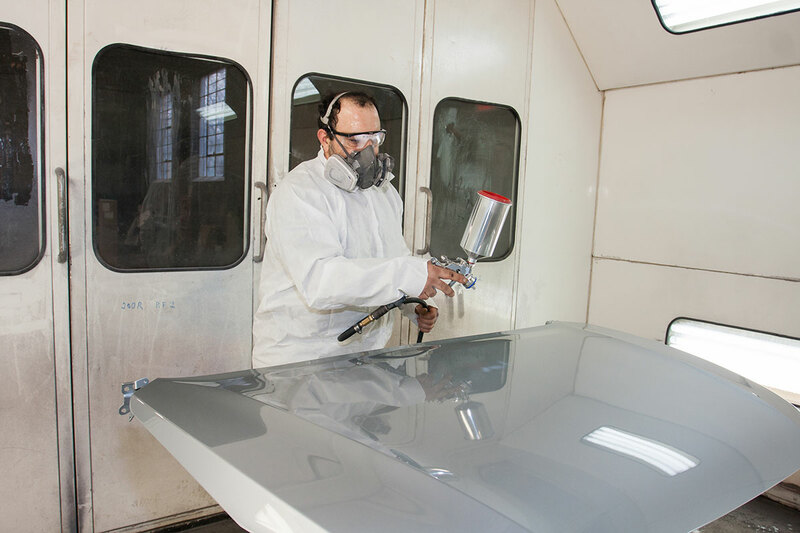 Our technicians that specialize in this area of collision repair will replace the exterior panels and complete any required sheet metal finishing tasks. Once this segment of the auto repair is completed it proceeds to the next step. 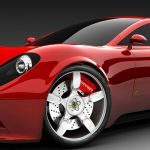 Your vehicle is now at the stage where it has been completely repaired and the esthetics of it now has to be the priority. 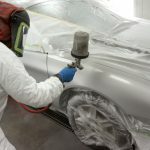 Each segment of the vehicle is primed and sealed which is then followed with a quality top coat of the applicable color. The paint is then sealed with the appropriate clear coats. 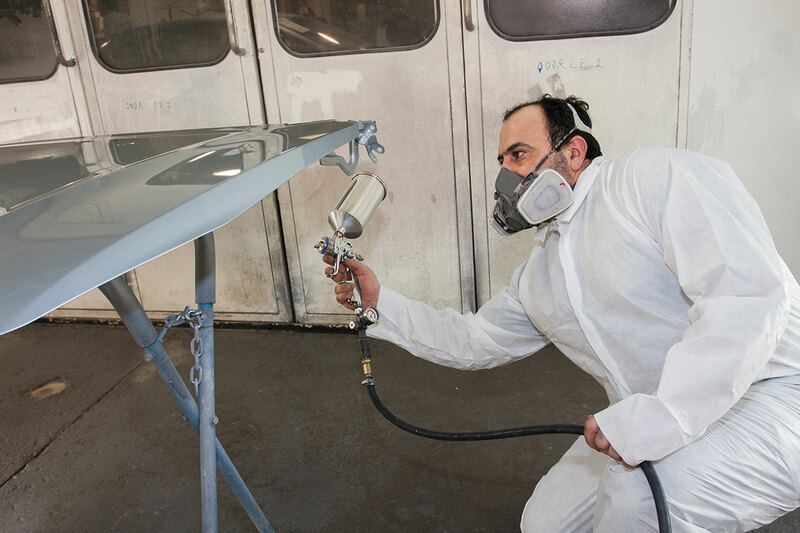 Our vehicle paint technicians here at Deluxe Auto Body and Frame are well recognized for their expertise and skills in vehicle paint applications that bring the best out in your vehicle once more. We believe that our services must include attention to detail. This is evident in our reassembly process where we apply the final moldings and detail pieces. Included in this process is a detailed check of all the vehicle systems to ensure they are in prime working order. Our technicians will now put the repaired vehicle through a cleaning process to remove all the dust and debris accumulation that occurred through the repair process. A road test is then conducted to verify the vehicle is in top running order. A final overall inspection is completed to confirm that the vehicle repairs and restoration meet our high standards that we have put in place for ourselves as responsible and caring auto collision repair specialists. Your vehicle is now ready to be placed back in your care and control. Depending on your preference you can either pick up your vehicle from our repair facility, or we will deliver it to you. We will provide you with your final invoice and carefully review it with you. The end result is that you can now forget about your nasty experience with your collision and once again get back to enjoying your beautifully restored vehicle.